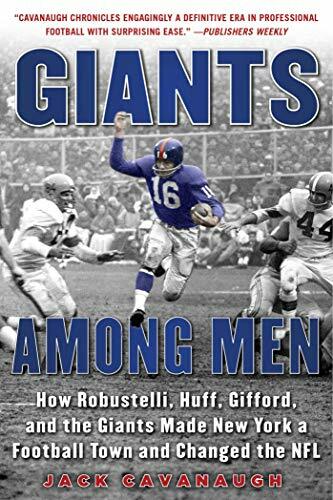 As is suggested in the subtitle of Giants Among Men, Jack Cavanaugh mounts an argument that the rise to prominence of the New York Football Giants between 1956 and 1963 produced two significant developments. First, the Giants became the most popular sports team in the crowded field of New York City. Second, the rise of the Giants was a catalytic force in the development of the National Football League as it moved to national sports preeminence. These are major claims, and although they remain open to argument, Cavanaugh makes a strong case for his conclusions. The emergence of a star-studded football team caught the attention of the public and then the New York media. This was seen in the growing attendance at Giants’ home games and in the emergence of extensive coverage of the Giants on the city’s sports pages. It may seem surprising that the second development was driven by the first. One widely held belief among those involved in professional sports leagues is that the strength of any league will, to a significant extent, depend on the strength of its New York franchise or franchises. This is based on the fact that New York is the center of the media, including the sports media, in America. The emergence of the Giants from the mid-fifties to the mid-sixties as one of the best teams in the NFL brought the attention of the New York media to the National Football League. Once the Giants moved into Yankee Stadium from the Polo Grounds attendance figures rose rapidly, and crowds of 60,000 fans came to be the norm rather than the exception. The Giants were a very good football team, but perhaps more important was the quality and character of the players who made very good copy for the New York writers. With a growing spotlight on the Giants, the press naturally paid increasing attention to the football lives of the players and coaches, while their private lives were still off limits. The fact that the Giants played in the most noteworthy championship game in NFL history certainly added to the appeal of the team even though they lost. The 1958 NFL Championship became the first championship game to go into sudden death overtime and was seen on national television. This game created a raft of new fans across the country and again put a major media focus on the NFL. Although an important development, the 1958 Championship was not as significant for the growth and development of the NFL as was the selection of Pete Rozelle as Commissioner of the League. His decision to move NFL headquarters to Manhattan was an extremely significant development. The Commissioner’s office was strategically and symbolically located midway between the advertising agencies of Madison Avenue and the national television networks. This development should have received a bit more attention from the author. One of the major strengths of Giants Among Men is the way in which Cavanaugh weaves the lives of the individual players into the season by season and game by game narrative. Clearly, Jack Cavanaugh had a direct and personal knowledge of many of the players, and more importantly, he was able to relate their personal and professional stories in an interesting and entertaining way. The portraits of the lives of Andy Robustelli, Frank Gifford, and Charley Conerly, and many more players both on and off the field are integrated into the game and season accounts. In football books and sports books generally, there is nothing worse than a game-by-game, blow-by-blow retelling of a season and of each game. Fortunately, there is none of that here. The stories of these players, their families, and their personal struggles in a time when off-season jobs were necessary to make ends meet, recall an era long past. Andy Robustelli held down as many as three off-season jobs, and even an assistant coach, Vince Lombardi, sold insurance in the off-season. If you are a lifelong fan of the New York Giants or a newcomer to the team, Giants Among Men is a treat. If, like me, you are not a Giants fan, there is much to be found in Cavanaugh’s narrative, and that would be true even for those who are only casual NFL fans. This era in the NFL is long gone, but Jack Cavanaugh offers a clear and concise look into one aspect of that world.